From flow charts to process maps and resource schedules, there are plenty of methods for planning and tracking business processes, assigning resources, and tracking the availability of resources. Among these daily operations, there are bound to be imperfections and errors, however, that lead to waste of time, resources, materials, and more. It is important to identify these leaks in processes in order to minimize waste or eliminate it where possible. The identification of where value is being added to a process and where waste occurs is where value stream mapping comes in. Value stream mapping involves taking a more detailed look at processes to identify where processes are effective and where production gets bogged down. The practice of value stream mapping assists businesses in closing gaps in production such as idle time (materials sitting around waiting for the next phase) and delays due to errors (such as defects). To get an understanding of value stream mapping, we will start a level above at a value stream map–a high-level process map. In a process map, processes are outlined, raw materials are listed as inputs, resources–such as people and machines–are listed as operators responsible for processing those materials in each phase, and products are listed as outputs. 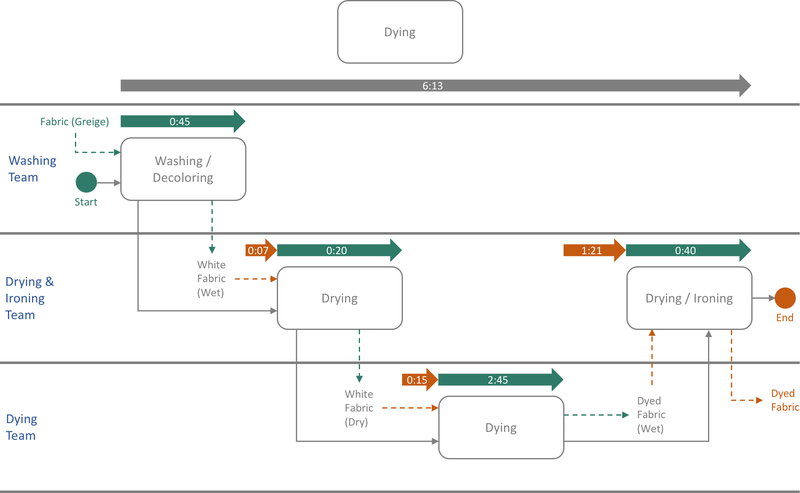 Following is an example of a high-level process map showing manufacturing processes for our example business, a manufacturer of organic bedding. It shows a high-level view of the process of creating bedding from the input of raw materials (fibers, such as cotton, polyester, etc.) to the output of the end product (organic bedding). For simplicity, we exclude the packaging process. As you can see, this gives the viewer a great bird’s-eye view of the manufacturing process. But what it does not do is show the viewer what happens to each input within each phase. For example, what specifically happens to the fibers within the spinning process? What processes does the yarn go through in order to be turned into fabric? And so on and so forth. To answer the previously-asked questions, we must go a level deeper than high-level process charts and break each phase down into its individual sub-processes. This will allow an analyzer to see how much time and resources are used and how they are used within each step of the process. In this value stream map, we go from high-level–level 1 with summary detail–to detail level–level 2 with added detail. Notice that each phase has the team responsible for completing that phase in blue. Each phase shows its output as well. For example, the dying team outputs wet, dyed fabric that is then passed on to the team responsible for drying and ironing. The gray arrow at the top displays the entire time taken for the dying process, six hours and thirteen minutes. The colored arrows below display time where value is added and waste. The green arrows show where value is being added. The orange arrows show delays and lag time–where there is waste. The delays in between phases 1, 2, and 3 could possibly be shortened or eliminated. However, the obvious large problem lies in between the dying process and the final drying and ironing process. We can see that a full hour and 21 minutes passes on average between the time that a set of bedding is dyed and the drying and ironing team gets to it. Upon analysis, it could be discovered that this is due to slow staff, broken or inefficient drying or ironing equipment, poor communication, or any number of reasons. There are a host of additional details and useful icons that are commonly added to these diagrams. However, this thorough overview should provide you with a firm grasp on the purpose of value stream mapping and how it helps close waste gaps in production.